China’s military has equipped its forces with blinding laser weapons in apparent violation of an international agreement signed by Beijing. "China has been updating its home-made blinding laser weapons in recent years to meet the needs of different combat operations," the official military newspaper PLA Daily reported Dec. 9. "Blinding laser weapons are primarily used to blind … targets with laser[s] in [the] short distance, or interfere [with] and damage … laser and night vision equipment," the brief photo report stated. A State Department official expressed concerns that the weapons appear to violate a provision of the United Nations 1980 Convention on Certain Conventional Weapons. The convention includes a 1998 Protocol on Blinding Laser Weapons banning their use in combat. "The United States is committed to the CCW and expects all parties to uphold the convention and its protocols," the official told the Washington Free Beacon, using an acronym for the 1980 convention. China agreed to follow the prohibition in 1998, according to the convention’s website. A Chinese Embassy spokesman did not respond to an email request for comment about the laser weapons. Jack Daly, a retired naval intelligence officer who suffered eye injuries in 1997 from a laser that was fired at his helicopter by a Russian intelligence-gathering ship near Port Angeles, Washington, said he is concerned the Chinese laser arms could end up in the United States. "The U.S. already has a problem with laser pointers being directed at in flight aircraft," Daly said. "If these laser guns make their way here, we are very likely to see aircrews actually blinded during flight and possibly worse." In response to numerous incidents of laser pointers being used to illuminate commercial aircraft pilots in flight, the FBI last year launched a campaign offering rewards for people illegally firing laser pointers at aircraft cockpits. "When aimed at an aircraft from the ground, the powerful beam of light from a handheld laser can travel more than a mile and illuminate a cockpit, disorienting and temporarily blinding pilots," the FBI said in a statement. The Air Force is reportedly developing airborne lasers for use against enemy aircraft, drones, or missiles. The Navy has deployed a Laser Weapon System to defend ships against drones, small boats, and submarines. 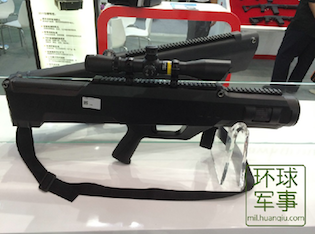 However, the military has no plans for laser rifles similar to the Chinese guns. Rick Fisher, an expert on Chinese weapons systems, said the PLA has at least two types of laser guns and may be seeking to sell them abroad. 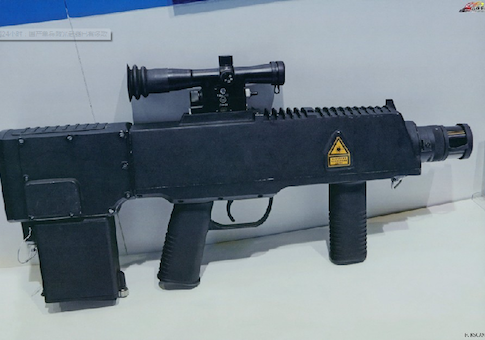 While not currently observed for sale at the global arms exhibitions, Fisher said Chinese arms sellers attending arms shows likely interacted with foreign customers for the lasers. "There is a strong possibility these new dazzlers are being marketed for foreign sale," he said. 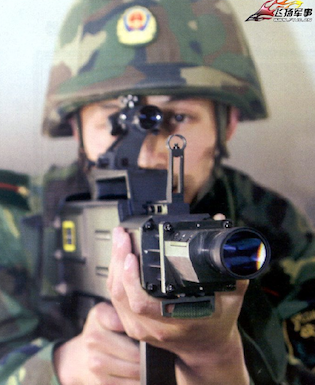 On the same day the PLA Daily report on blinding laser rifles was published, the Communist Party-affiliated newspaper Global Times produced a more detailed report that included drawings showing how the lasers are fired at enemy troops. 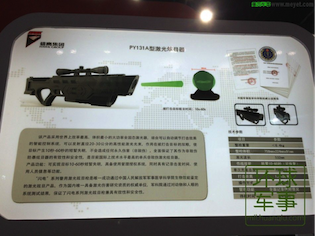 The Global Times report shows four different types of laser guns, including the BBQ-905 Laser Dazzler Weapon, the WJG-2002 Laser Gun, the PY132A Blinding Laser Weapon, and the PY131A Blinding Laser Weapon. Fisher said the photos of the laser weapons appear to have been taken at a large civil-military integration exhibit held in early December. "While they are being portrayed as police assist weapons, they could also be used on battlefields," said Fisher, an analyst with the International Assessment and Strategy Center.